Donald McKayle Dance Company. Jerry Grimes, Clay Taliaferro, John Parks, and Rodney Griffin. 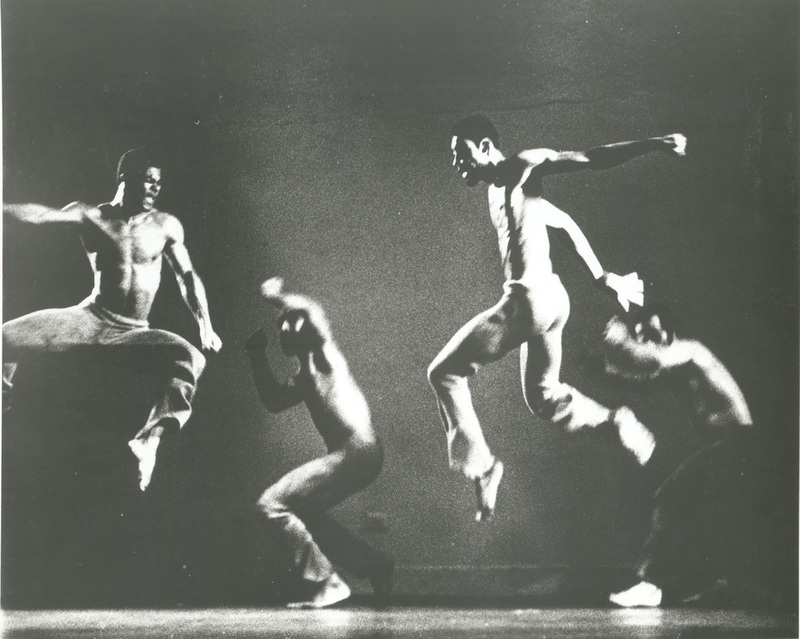 Donald McKayle’s masterwork, Rainbow Round My Shoulder, is acclaimed as a modern dance classic. A searing dramatic narrative, it is set on a chain gang in the American south where prisoners work, breaking rock from “can see to can’t see.” Their aspirations for freedom come in the guise of a woman, first as a vision then as a remembered sweetheart, mother, and wife. The songs that accompany their arduous labor are rich in polyphony and tell a bitter, sardonic, and tragic story. It was created for the Donald McKayle Dance Company, and has been perfomed by Alvin Ailey American Dance Theater, Batsheva Dance Company and Dayton Contemporary Dance, among others. Dance power and artistic controversy are the bookends for “Spring Collection,” an emotional program of ballet, modern and jazz dance repeated this weekend by the School of Dance at the University of Arizona. ...guest artist Donald McKayle’s “Rainbow Round My Shoulder” became one of those unforgettable theatrical experiences. Set to a series of recorded work songs, McKayle’s masterwork dramatizes the plight of a southern chain gang toiling in frustration. Seven bare-chested and muscular young men in loose-fitting brown pants project the cruelly harnessed strength of prisoners confined to do the work of their captors. Back muscles flex in unison. Bare feet slam the floor. Faces and bodies twist in anger, but always comply with the master’s wishes because these men have no choice. Female fantasy appears, promising pleasurable distractions. On opening night last weekend this role was danced beautifully by Eboni Taylor. While the men create massive walls of energy with broad shoulders, the woman flows with serpentine grace. At times she also tightens those coils with a strength of her own making. The music itself, filled with minor chords and bitter lyrics, becomes a lamentation that colors the brute force of McKayle’s choreography. “Rainbow Round My Shoulder” premiered in New York in 1959. Seen through 50 years of activism for civil rights, the piece has become more powerful.